Herein, I open a brief dialogue regarding root causes and justifications underpinning the JIHADI "ANYTHING GOES" RULES OF ENGAGEMENT AGAINST "THE INFIDEL," and specifically, Muslim religious and legal contemplations of THE USE OF WMD'S, including Nukes, Biological and Chemical weapons against the Infidel. 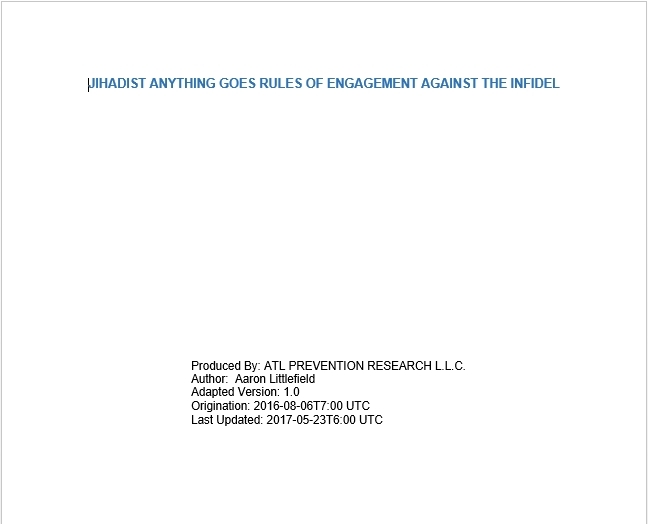 Essentially, this topic is useful for (partially) understand Islamic jihad rules of engagement, that rely upon several portions of text from the Koran, Hadith, and elsewhere to justify and mandate Genocide of the Infidel by any type of method (as needed or desired). This topic does not imply actions to take towards Muslims, but rather, it discusses actions they are obligated to take towards infidels (via Sharia Law). Information and interpretations below, are not my own, but rather are a small collection of relevant versus and Islamic Law interpretations (of “scholars of various Islamic legal schools” created by their own authorities) which have been compiled herein, for the purpose of exploring this topic. This topic does not imply any specific sweeping judgements or actions towards any groups, as (all Bad actors engage in their own Bad actions through their own individualized decision making processes may or may not partake in jihad or support for terrorism), many will choose to take no action and live peaceful and prosperous lives.